[NEWS] 130212 Iris 2's MBLAQ LeeJoon and BEAST DoJoon reveal "No rivalry ongoing"
Two idols talked about their friendship at the IRIS 2 press conference. During the press conference held at Lotte Hotel Seoul, a question was asked to LeeJoon ,"On the series, Yoon DoJoon plays your rival, at the same time, he is also an idol. Is there any rivalry?" In which, Joon immediately replied, "BEAST is definitely not our rivals at all. In fact, the members are all our friends. We get along well. Me and DoJoon are just like brothers who play together. There's no rivalry at all." He also added, "Four years ago, DoJoon supported me alot, he is kind a good friend to me. I'm a year older and we often meet outside and talk." In which Doo Joon gave a thumb up sign. 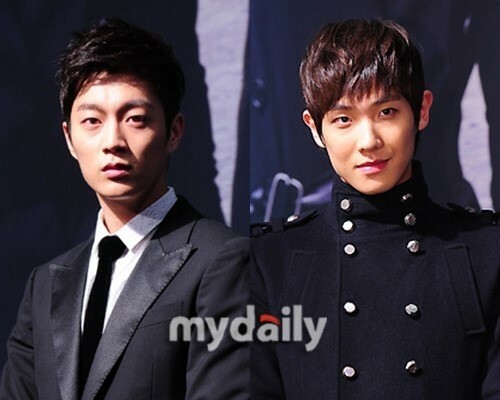 DooJoon will play the character of NSS agent Seo Hyunwoo and Lee Joon will play the role of NSS agent Yoon Shi Hyuk. The sequel IRIS 2 will be broadcasted on February 13.